Some award rules have a condition that means they can only apply when they're selected as a 'shift tag' on a timesheet. The first step is to categorise staff according to their classifications (full time, part time, casual etc). We can also use this tool to add the tags that have been created through award rules to staff. Check out this article to see how to easily bulk categorise staff. After staff are assigned the tags set out in award rules, you need to make sure that we have the option to use shift tagging on timesheets. If you have used the bulk tagging tool, whatever tag you selected will be there already. Alternatively, you can also just tag staff here. 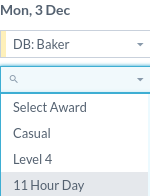 When selected, the award rule that is linked to the shift tag will now apply for that shift. If you would like further assistance please contact Tanda Support by clicking on the blue chat icon in the bottom right corner, on 1300 859 117 or support@tanda.co.